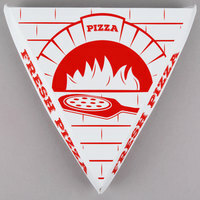 Ensure that your pizzeria or Italian restaurant is stocked with our pizza slice holders for customers that want to order a single slice of pizza. These products can hold a single slice of pizza, making them perfect for customers that only order one slice of pizza to go or others that want to take their leftovers home. Several of our pizza slice holders also have ingredient checklists on the side, so your customers can easily identify which slice of pizza is in which holder without having to open them. Also make sure to check out other great items from Choice and Solut. Pizza slice boxes are wide, and they can accommodate large slices of pizza, so you don’t have to worry about breaking or bending your slice to fit it in the box. 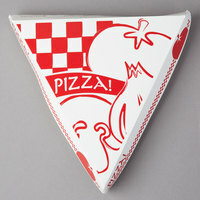 Many of our pizza slice boxes also have attractive designs on top for added visual appeal. And, while these products are ideal for take-out service at your pizzeria or Italian restaurant, they’re also an excellent option for convenience stores that offer pre-made pizzas. 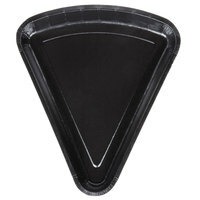 For more products for your pizzeria, check out our pie servers, countertop pizza ovens, and pizza oven tools. If you're wondering where to buy pizza slice boxes, we have a large selection of pizza slice boxes for sale at the lowest prices.